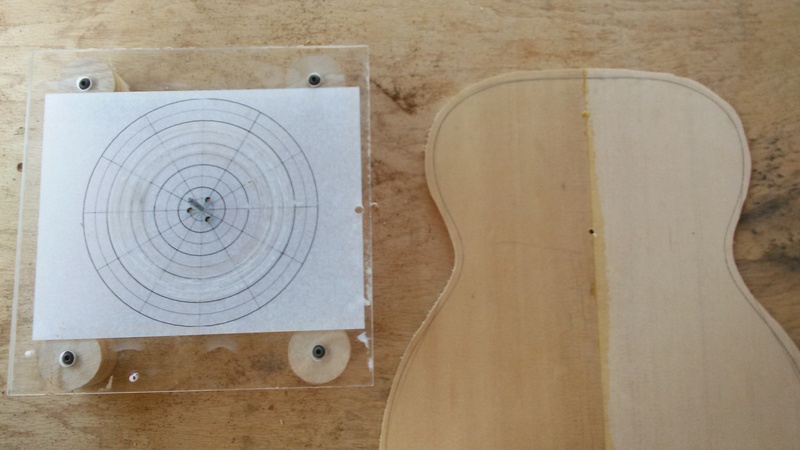 Measure out and mark the center of the soundhole on the soundboard. 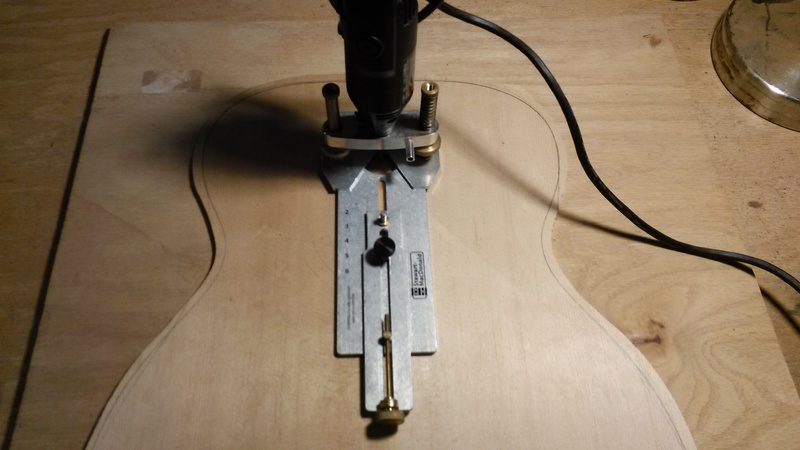 I do this by tracing the outline of the form on the soundboard and measuring (in this case, 149 mm) from the top of the outline down the glue joint of the bookmatched pair. The jig on the left side of the picture is the Radial Rosette Maker which was used to make the rosette for this operation. You may want to see Radial Rosettes: Building the Radial Rosette Maker and Radial Rosettes: Making a Basic Pattern if you have not created your rosette yet. 2. 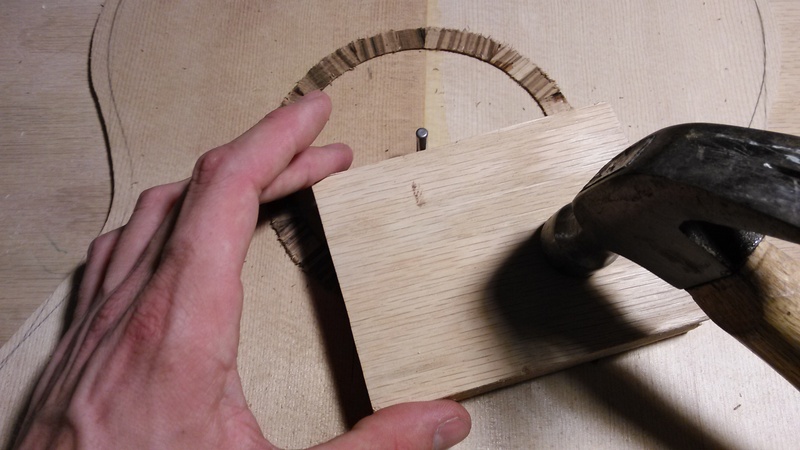 Drill a hole the appropriate size for your circle cutting jig. 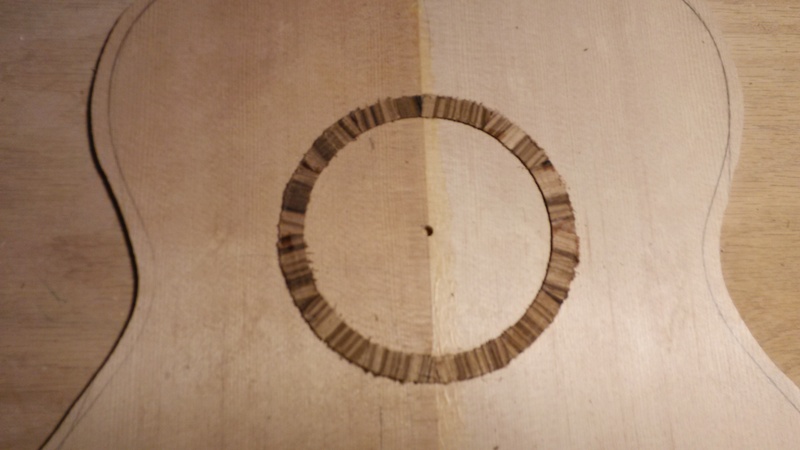 Here I will be using a Dremel tool and the Stewmac circle cutting jig so I will drill a 3/16″ hole. 4. Measure out from the center pinhole the location for your rosette and mark at several different radial points. Take your rosette and trace its outline along these points. Now set the radius for your circle cutting jig to make the first cut somewhere near the middle of your outline. Set the depth of cut to about 1/3 of the width of your bit. For example: I am using a 3/32″ spiral downcut bit, so the I will set the depth to about 1/32″. 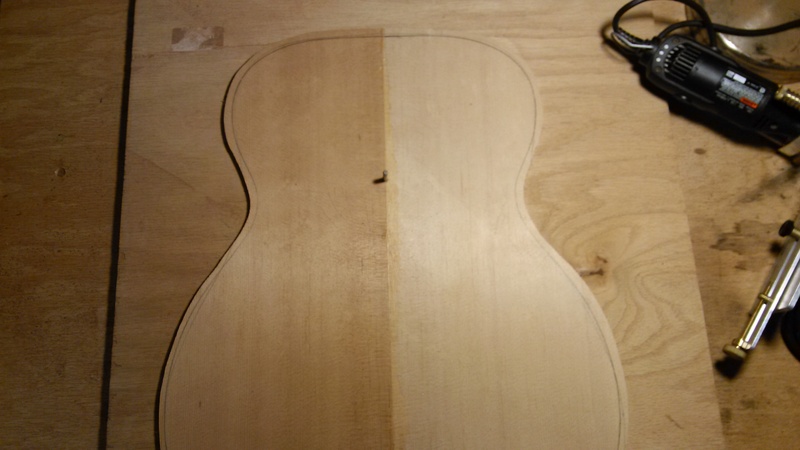 Make the first pass starting and ending in the area where the fretboard tongue will lie, so as to cover up any mishaps that may occur from starting and stopping the bit. After the first pass, again, increase the depth by about 1/3 the width of the bit and make a second pass. Keep making passes like this until you reach an appropriate depth. 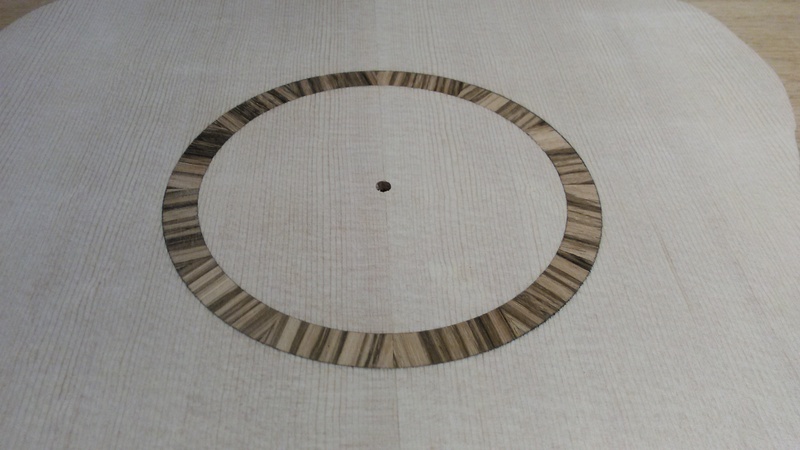 An appropriate depth is one that allows you to seat the rosette firmly but with it sticking up just a little proud of the soundboard surface. 5. Once the appropriate depth is reached, adjust the radius of the circle cutting jig so that it takes just a hair off of the outside edge. Make a pass. Continue adjusting the radius and making passes until the you reach the outer limit of your rosette outline. 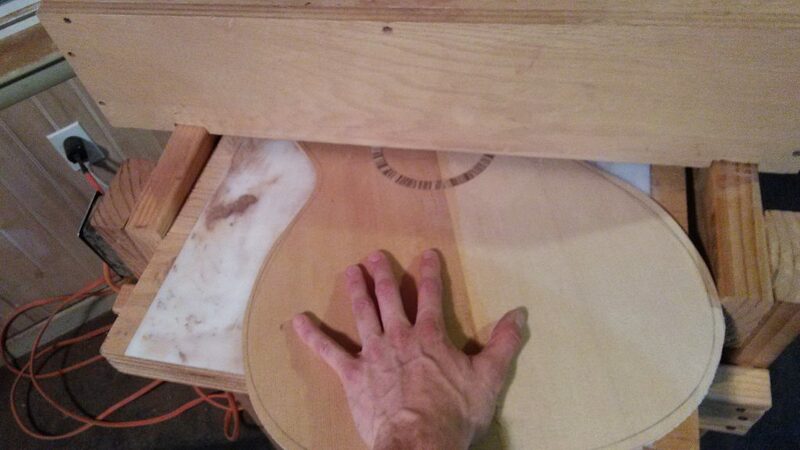 Now adjust the radius to take material off of the inside edge. Make passes in this direction, continually checking with your rosette piece until the rosette drops in snugly. In the picture below I am using a hammer and a block to seat the rosette for a perfect snug fit. However, having a lot of experience with installing rosettes, I know when it is appropriate to tap the rosette in like this. It is therefore important to note that I am not forcing the rosette into an undersized channel. You can damage both your rosette and the channel by doing this. When in doubt, make the channel wider. It is better to have a loose fit than to destroy your workpiece. Tip: If you are having trouble fitting the rosette piece, try carefully breaking or snapping the rosette at one point. This makes the piece more flexible as it is no longer a closed loop. The area of the break, of course, will be hidden beneath the fretboard tongue. 6. If the rosette is a very snug fit, as it is below, there is no need for glue at this point and you can skip to the next step. If it is seated somewhat loose, run a bead of water thin CA glue along the edge and let it wick down into the channel. 7. 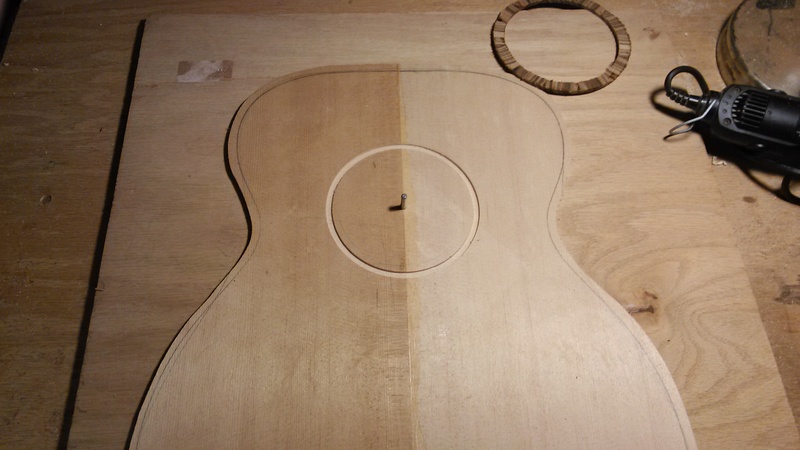 Sand or scrape the rosette flush with the soundboard surface. Here I am using a drum sander to accomplish this task but some sandpaper, a hard block and elbow grease works as well. 8. Once it is close to flush, I fill any gaps that may have resulting from an imperfect fit. Ebony dust and CA glue works great for this. I spread the ebony dust around the edges of the rosette until all the gaps appear to be filled and level with the surrounding surface. 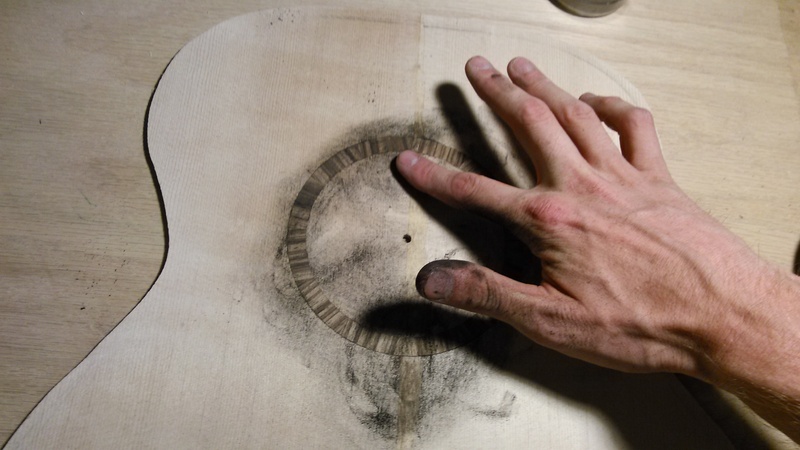 Tip: It is important to loosely spread the ebony dust rather than attempting to pack dust into gaps with your fingernail. Loosely filled gaps allow for the CA glue to percolate down through the entire fill. 9. Using water thin CA glue and a “wip tip” on the bottle, carefully run another bead of CA around the inside and outside edges of the rosette. Give it several seconds to percolate down into the ebony dust fills before spraying accelerator. Note: CA glue stains spruce deeply. 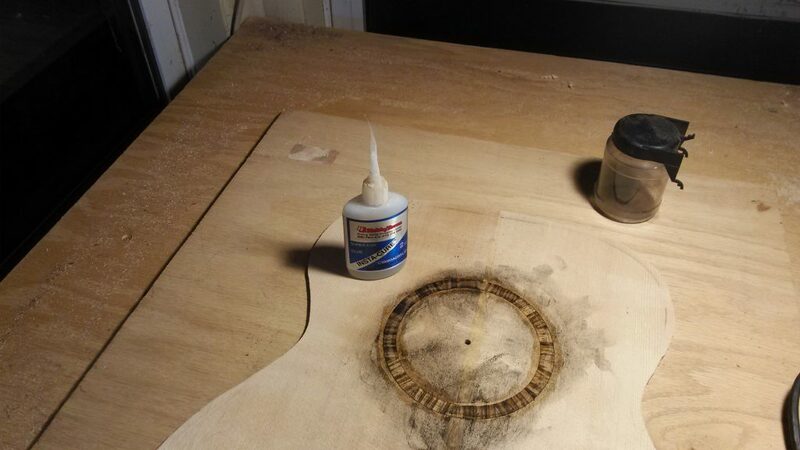 That is why I install the rosette BEFORE thickness sanding the soundboard; So that I have plenty of material to sand through in order to remove those deep stains. 10. Finish sanding or scraping the rosette flush to the surface. If you find that you still have gaps do a second ebony dust fill and re-level. If you did everything right your rosette should look something like the picture below.